The Biological-Physical Interactions (BPI) Lab houses flow tanks and instruments for observing interactions between fluid motions and plankton. 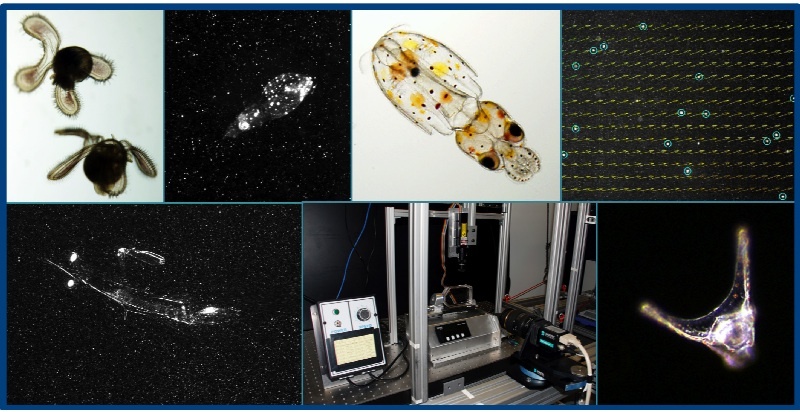 Recent projects have focused on swimming mechanics, flow sensing, and energetics of invertebrate larvae. For examples, see the Fuchs Lab. The BPI Lab contains specialized tanks that produce steady and unsteady flows, including wave motions and turbulence. We observe plankton and fluid motion simultaneously using particle-image velocimetry (PIV). The PIV system includes two PIV cameras, a green Nd:YAG laser (532 nm), and two near-infrared lasers (808 nm) for observing light-sensitive plankton. We also have an Olympus DP72 for taking photos and videos of plankton under the microscope. For more information, contact Heidi Fuchs.